It is with sheer delight that I can finally announce this! My first eBook is now published and available in the Kindle Store on Amazon! 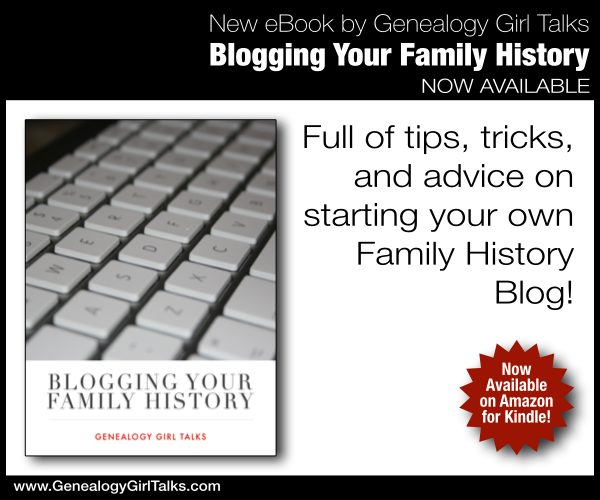 If you have ever considered Blogging Your Family History and you need a little encouragement to get started, you will want to read this book! I cover topics like when to start your Family History blog, why start one, what to name your blog, and more. I also offer advice and ideas on what to blog about. You can also click HERE for more information on this book. I am beyond excited for this new adventure and hope it will help you as you start your new journey Blogging Your Family History!